Set up as shown in diagram. If the player makes the shot, then they will go to the back of the line and the next player will shoot. If the next player makes the shot, then the player on the "hot seat" is out. If the next player misses then the player on the "hot seat" goes to the back of the line and the player who missed takes their place on the "hot seat". The winner is the last person in the game. 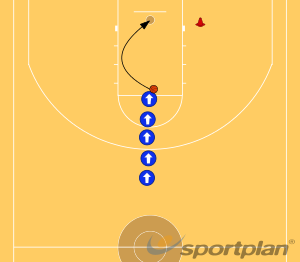 This is a fun game that puts the pressure on shooting! If you have a large group, you can play at multiple baskets and if a player gets knocked then they move on to the next basket.